How Far is Srimitra Solitaire? Sri mitra Solitaire is an elaborate composition of architectural orchestra with a total of well designed vaastu complaint 70 homes planned in a location which is so pivotal and strategic in terms of proximity to the offices, schools/other educational institutions, range of prominent malls, other commercial entities, hospitals, etc etc clubbed with whole range of amenities planned, one surely soaks in the feelings of value for money for which one has to travel miles off main happening areas. 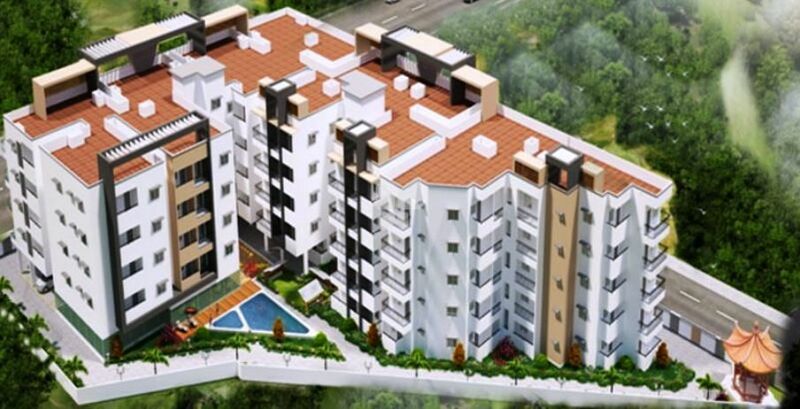 At sri mitra symphony, the construction is 100% as per the government sanction plan with no deviations and quality specifications, there by catering to large segments of actual users. R.C.C. Framed structure designed for seismic forces zone-Ill earth quakeg resistant using steel according to National Building Code of India. Bangalore is in zone-II. 6" & 4 "solid concrete blocks for external and internal walls. Sponge finish for external walls and neeru finish for internal walls. Vitrified tiles in hall, dining & other rooms and antiskid tiles in toilets, utilities and balconies. Teakwood frame and OST flush door, polish finishing with fittings. Sal Wood frames and flush doors with powder coated aluminium fittings and film coated flush doors for toilets. Powder coated two track aluminium frames and aluminium glass shutters along with safety grills. For Bed rooms three track along with mosquito net. Asian plastic emulsion paint for internal walls, ceiling, Asian ace for external walls and Asian enamel paintfor doors. Polished granite stone platform with stainless steel sink, Glazed tiles dado upto 2 feet height above Platform. BWSSB water connection will be provided in the kitchen. Provision for Aqua guard. Switch and socket for electrical chimney and microwave owen will be provided. Glazed tiles dado upto door height is provided. Geyser Provision in all toilets. Sanitaryware of Parryware or equivalent and C.P. bathroom fittings of Mark or equivalent will be provided. Concealed copper wiring and electrification with adequate light & fan points in all rooms and T.V. 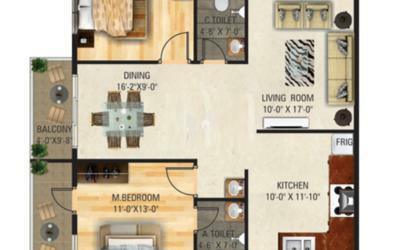 Points in hall and master bed room of Anchor Roma modular switches or equivalent will be provided. Switch and socket for fridge, Washing machine, Microwave owen, Exhaust Fan, Mixer, Geyser and A.C. in master bedroom will be provided. ELCB (RCCB) & MCB for safety. 2 no.s of 8 passanger V3F lifts or equivalent. Stand by Generator for lifts, pumps, common area lighting and 500 W of power backup to each flat during power failure. Ample space for car parking with a wide drive way. B.W.S.S.B. water supply adaquately supplemented by 6 dia borewells for water supply. Intercom facility for flat to flat and also all flats to security. Granite or Marble or Tiles Flooring.